Bitcoin and other Cyrptocurrencies have their own ups and downs. There were times where Bitcoin hit $20,000/coin, there were also times where Bitcoin dropped into half of its peaks value. Other Cyrptocurrencies also more or less the same. If you are investing in one or few of them, like me, then each and every day you may get either headaches or heartaches, especially if you bought them during the peak and now you see the value left at half the original price you bought. Mining Bitcoin is so yesterday. Mine this instead. No mining rigs required. No spending of money required to acquire it. While Bitcoin and other altcoins or other Cryptocurrencies are volatile to the market sentiments and also consider expensive to produce – you need a powerful mining rigs and enormous electricity to mine Bitcoin and other famous and high rank Cryptocurrencies – Sweatcoin is something totally different. While you may get headache and heartache with Bitcoin and other Cyrptocurrencies, with Sweatcoin is the other way around. Your headache and heartache may get cured a long the way. Like its name, Sweatcoin is mined through your sweat. 😮😲😨?! Well, technically. Though it may seems disgusting to you 🤢 – especially if you are now imagining how a sweat can be converted into a digital coin – but it’s actually not. And today there’s no such adapter that convert your sweat into computer bits – in case any of you wondering. You don’t need to do something with other people sweat. What you need to do is you, yourself, to go sweating. Sweatcoin, despite its name carries ‘coin’ but Sweatcoin is unlike other Cyrptocurrencies coins where you run certain mining program or altogrithm to get the coins. Well, in fact I don’t think Sweatcoin is categorize as Cryptocurrency. Sweatcoin is a digital coin made by Sweatco Ltd. company that promotes you to do exercises or at minimum to walk, so that you can generate steps which in the end, Sweatcoin app shall convert the steps to Sweatcoins where you can exchange it for coupons or offers or even physical items such as iPhone X. Interested? Well, continue to read then. What you need to do to start ‘mining’ Sweatcoin. 3 important components to start ‘mining’ Sweatcoin. 1. Smartphone – Either Android or iOS based. Here’s the step by step in detail how you can start ‘mining’ Sweatcoin. 1. Download the Sweatcoin app. They are available in both Android Google Play Store and iOS App Store. You don’t need to join under my referral link if you don’t want to. Alternate links, direct to App Store and Google Play Store, if you can’t/don’t want to download using link provided above. The app – as of this article is written – only available on U.S, U.K and Ireland. 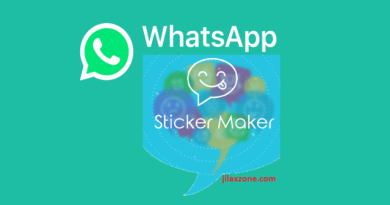 First time the app is started, it will asked your name. Give your nickname. 3. Give access to GPS. Sweatcoin – Convert Steps into Currency: Give access to both Steps and GPS. Next is to give FULL access to GPS. It won’t work without GPS always turned on. 4. Phone Number and Email as the Wallet Key. Unlike Bitcoin and other Cryptocurrencies where they are using combination of complex characters and numbers, Sweatcoin Wallet private key is just your phone number plus email. 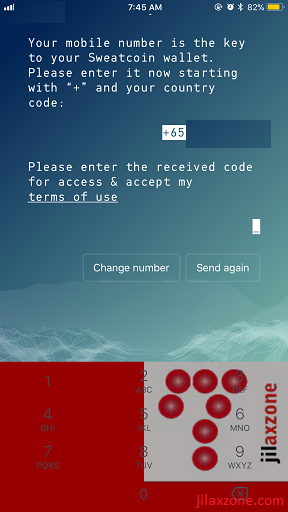 Key in your phone number to secure your Sweatcoin Wallet to receive confirmation code. Key in your email address after that. 5. Invite Others to Receive $5 Sweatcoin. 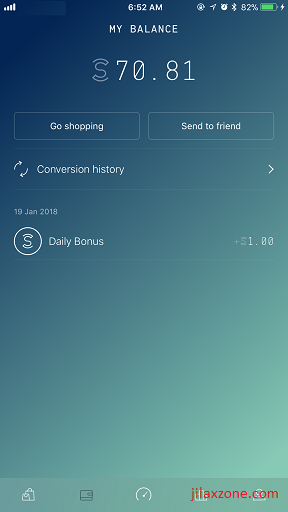 Sweatcoin – Convert Steps into Currency: My Referral Link. Join and be my friend. Like me, do invite others so that you can received $5 Sweatcoins. Share your invitation link to friends, family and peers. 6. Start mining = start sweating. At first, your level (monthly subscription) will be Mover. But along the way, you can change and upgrade to higher level. Mover: Forever free. Earn daily up to $5 Sweatcoin/Day. Shaker: $4.75 Sweatcoin/Month. Earn daily up to $10 Sweatcoin/Day. Quaker: $20 Sweatcoin/Month. Earn daily up to $15 Sweatcoin/Day. 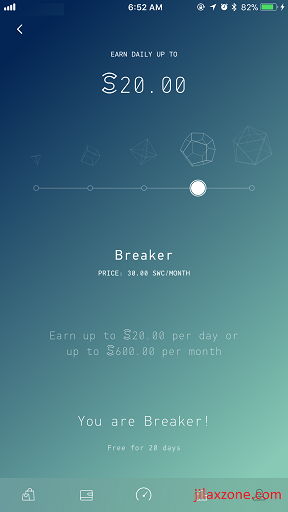 Breaker: $30 Sweatcoin/Month. Earn daily up to $20 Sweatcoin/Day. As you can see, the good thing is that, the subscription here is using Sweatcoins and not real money. So if you think you can produce more than $5 Sweatcoins per day, do consider upgrade to Shaker. And so on. And the best thing is that, you can have 30-days trial to try all the levels for FREE! 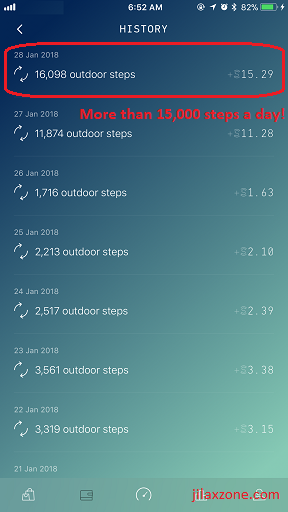 Sweatcoin – Convert Steps into Currency: I can produce more than 15K Steps in a day. What about YOU? I’m currently on Breaker level (trial only), because I managed to produce more than $15 Sweatcoins/Day, especially on the day I’m doing food delivery. Read my story here. What you can get or exchange from Sweatcoin? In case your country is not supported yet, you won’t see anything on the Store screen. But don’t give up yet. Change the store in Settings to supported countries such as U.S, then you can start seeing the items, coupons and/or discounts that the store offers you. While I haven’t redeemed (or exchanged) anything myself but I think for certain items, especially digital coupons such as PayPal credits can be easily redeemed once you get enough Sweatcoins to exchange for, regardless of which country you are standing now, supported or not supported. Reason I haven’t redeemed anything is because I’m currently staying in Singapore and Singapore is not yet supported by Sweatcoin. Second, is because I don’t have enough Sweatcoins yet to redeem something meaningful. As of today I got $70.81 worth of Sweatcoins on my wallet. Not sure how the team behind Sweatcoin got their money to provide all the coupons, discounts or items, but yes once you have enough Sweatcoins, you can exchange it with those things. Though Sweatcoin is officially released only for the following 3 areas: US, UK and Ireleand but that doesn’t stop me, you and the rest to download it today and start gathering Sweatcoins. The moment the app is officially released at your area, you may already have plenty of Sweatcoins ready to be spent. Download and start mining (read: sweating) your Sweatcoin today! In Singapore, there’s alternative to Sweatcoin. Healthy 365. It’s not really a coin, but gets you similar rewards for getting yourself sweaty. Read here for details. ← The Most Precious Asset and Commodity of All TIME – MUST INVEST and 100% GUARANTEED Worth It!